Dionne Brand is shortlisted for the Griffin Poetry Prize for The Blue Clerk. The seven finalists for Canada’s Griffin Poetry Prize, which recognizes the best books of poetry published in this county and abroad, were announced on Tuesday. One of Canada’s most prestigious literary awards and one of the world’s most generous poetry prizes, the Griffin is named after philanthropist Scott Griffin. The annual honour is worth $65,000 each to one Canadian poet and one international poet. 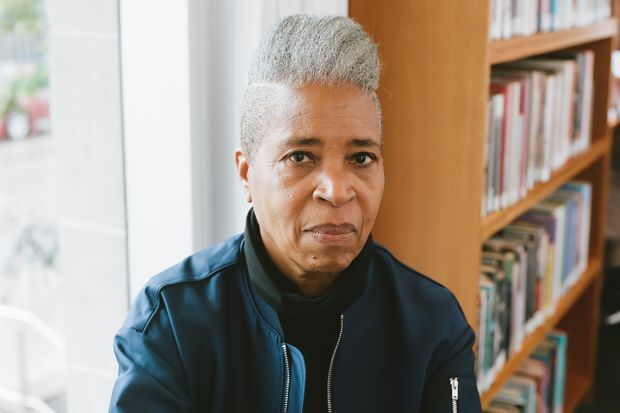 The Canadian shortlist of three nominees includes Dionne Brand, a past winner of both a Governor-General’s Award and a Griffin (in 2011, for her mesmerizing long poem Ossuaries). This time around, the Trinidad-born, former Toronto Poet Laureate is nominated for The Blue Clerk, a contentious discussion between the poet and the titular keeper of the poet’s pages, using a series of prose poems that invoke everyone from American jazz saxophonist John Coltrane to Argentine writer Jorge Luis Borges. Quarrels comes by Anvil Press, an independent publishing house in Vancouver. Joseph’s two previous books of poetry, The Startled Heart and The Secret Signature of Things, were both shortlisted for the Dorothy Livesay Poetry Prize. Her non-fiction work, In the Slender Margin: The Intimate Strangeness of Death and Dying, was chosen by The Globe and Mail as one of the 100 Best Books of 2014. The third nominee for the Canadian half of the Griffin is Sarah Tolmie, an associate professor of English at the University of Waterloo and medievalist trained at the University of Toronto and University of Cambridge. Described as a modern danse macabre in 89 parts, Tolmie’s The Art of Dying, published by McGill-Queen’s University Press, was praised by the jury as a “multifaceted meditation on mortality beneath its deceptively simple lyric surface.” The author herself was singled out as an “irreverent feminist” in the tradition of Dorothy Parker and Stevie Smith. Given that the Griffins were first handed out in 2001, neither Parker nor Smith were ever eligible the prize. Past Canadian winners include Anne Carson (twice), Christian Bök, Karen Solie and, last year, Cree academic and writer Billy-Ray Belcourt, for his part-manifesto and part-memoir, This Wound is a World. Among the previous international winners are Alice Notley, Charles Wright, Michael Longley and Alice Oswald. A year ago, the great American avant-gardist Susan Howe won the Griffin for Debths, a hybrid fusion of autobiographical prose, minimalist verse and found texts. The contenders for this year’s international Griffin are the British-Jamaican Raymond Antrobus (for The Perseverance), Chicagoan Daniel Borzutzky (Lake Michigan), Korean-American Don Mee Choi (Autobiography of Death, translated from the Korean, written by Kim Hyesoon) and the Albanian-born Ani Gjika (Negative Space, translated from the Albanian, written by Luljeta Lleshanaku). Before arriving at their list of finalists, this year’s judges (Denmark’s Ulrikka Gernes, American Srikanth Reddy and Canadian poet-physicist Kim Maltman) read 510 books of poetry from 32 countries, including 37 translations. In the case of a winning translated work, the translator cashes 60 per cent of the prize money, while the poet pockets the rest. The authors of the seven shortlisted books are invited to read on June 5 at Koerner Hall in Toronto, while the two winners will be announced at a gala ceremony at the same venue the following evening. Every finalist who participates in the short-list readings receives $10,000.